There are some designers that seem to be more stealthy than others – you know, the ones that one day you suddenly notice you’ve got a lot of games by them but never realised it as you acquired them. Michael Rieneck is one of those for me – he’s designed games such as Cuba, Havana, Dracula, Fortuna, Palastgeflüster. 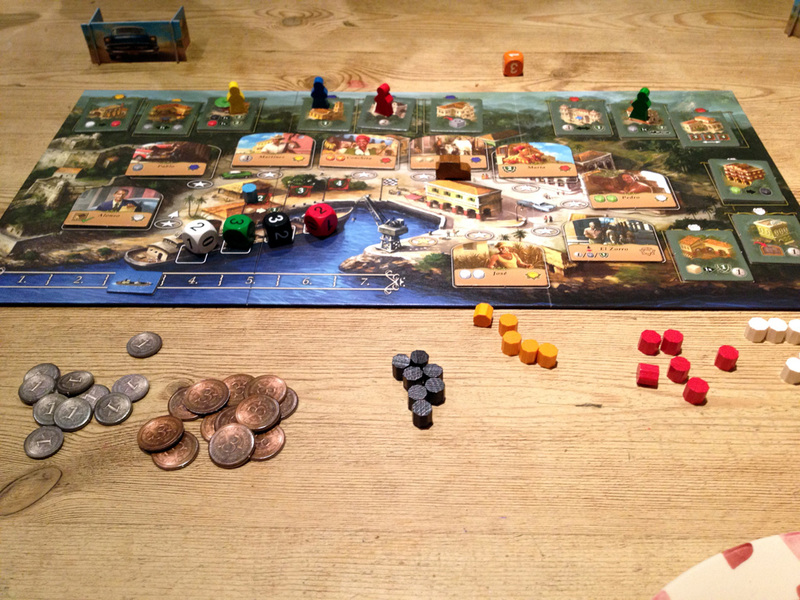 Santiago de Cuba is a hard game to fit into a single genre because it mixes several elements together and does so well. Players earn Victory Points (VPs) by delivering goods (tobacco, sugar, citrus fruit, rum and cigars) to the waiting ship, and the player with the most VPs at the end wins. The board shows a port town with a ring of 9 different Cuban characters and the dock as well. On their turn, a player moves the car piece clockwise around this ring – moving one space forwards is free, but costs 1 peso (cash) for every extra space after that.